In order to import scores to a School Loop assignment from Google Classroom or to invite students (a feature of our Google Classroom integration) district, administrators must import student Google IDs into the School Loop System. Prepare a text file that contains student IDs (the same ID imported to School Loop from your student information system) and the Google email address. Save the file with .txt extension. 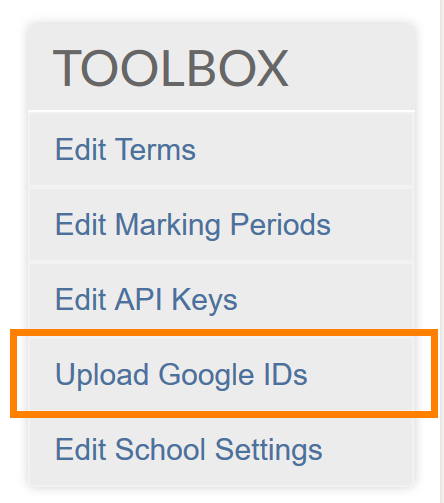 Navigate to your School Site List for your district and select Upload Google IDs. On the next screen, use the Browse... button to provide the text file that you want to upload, and then click Submit. You can always use the Download link right underneath to download the last Google IDs file used. Note: These IDs will need to be updated periodically to account for new students. A message saying that the Google IDs file is uploaded successfully is displayed.